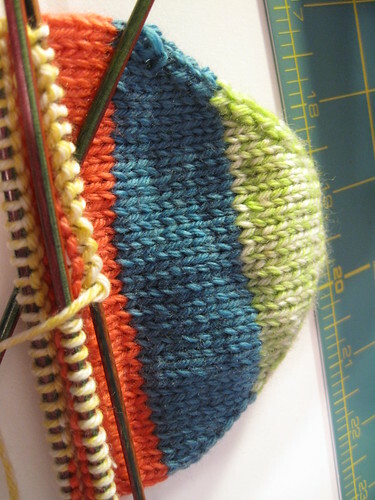 Earlier this year, I blogged about various stripey socks I have been working on. Sadly, neither of those pairs are done. Even the Christmas ones. Which I started in April thinking they would definitely be done way before Christmas. Oops. Anyway, more striped socks ended up on the needles, and I actually got a pair done. Woot! It's my new obsession: Knit Picks Felici Sport. (Side note: Just went to get the link to see they are discontinuing that yarn. Several just ended up in my cart. Ack!) Ah, sport weight socks. So fast to knit. I love you so. The above socks are knit in the Boutique colorway. 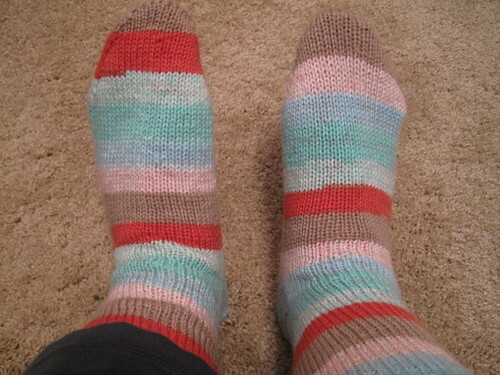 I think a goal for 2013 is to finish up all the stripey socks projects in the house. There are kind of a lot of them right now.